Christmas is upon us and it isn’t even Halloween yet. Don’t believe me? Walk into any Best Buy and look at how the GPS devices are positioned and priced, how the televisions are positioned and priced. Not that this is anything new. Back when I was young enough to be a stock boy at a dollar store, we would start preparing for Christmas sales in August. 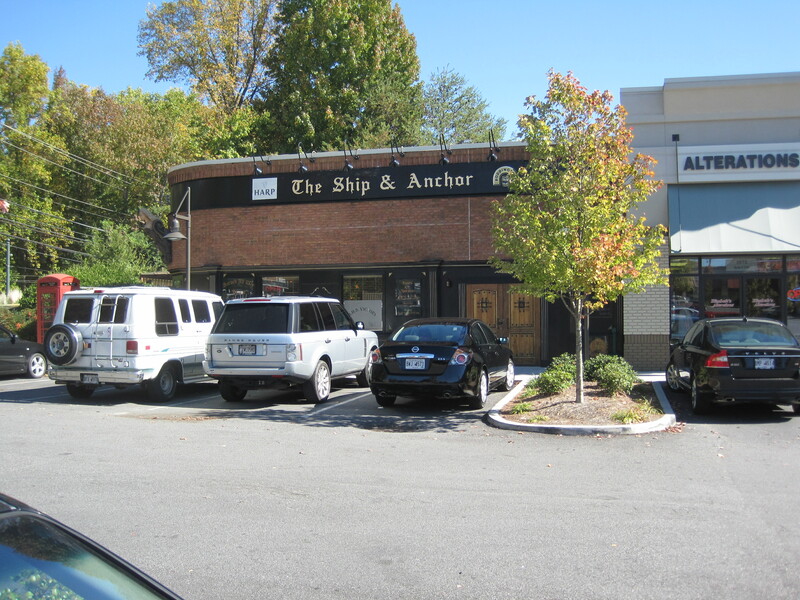 The Ship and Anchor is a Dunwoody Restaurant Group restaurant, which means it’s going to be an English-Irish themed restaurant with a menu it holds in common with other Dunwoody Restaurant Group places. You’ll have a small but good selection of beers, good mixed drinks, usually very good staff. Seating will be roomy and comfortable. What could this restaurant have that the others do not? In this case, a snaky ‘S’ shaped bar, a couple pool tables, a couple stuffed chairs. It’s laid out a bit differently and it’s along Sandy Springs, on the corner of Hammond and Roswell Road. For some the proximity to Whole Foods may make a difference. 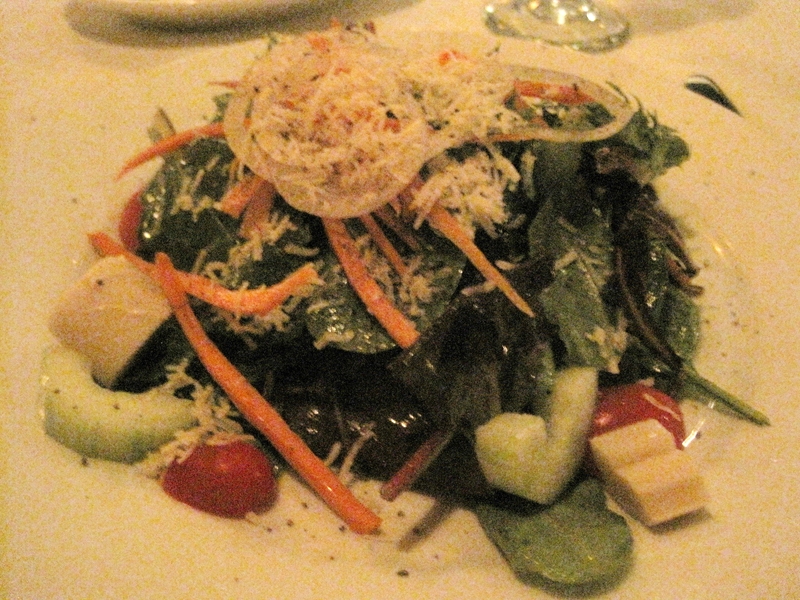 In my case it was there, and I’m very partial to their Mediterranean salad, a mix of greens and lamb. Staff was excellent. I enjoyed the visit a lot. 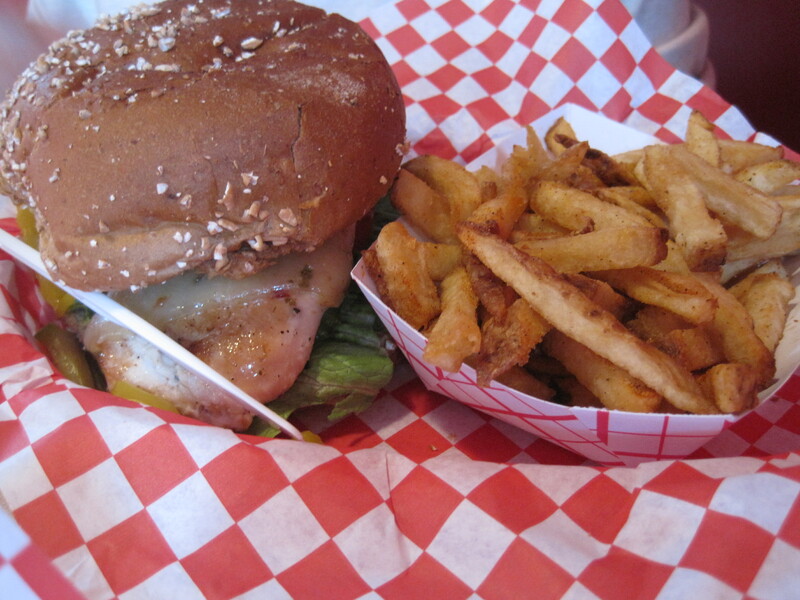 Verdict: One of a small chain of restaurants featuring good beers, good food, excellent staff. Highly recommended. 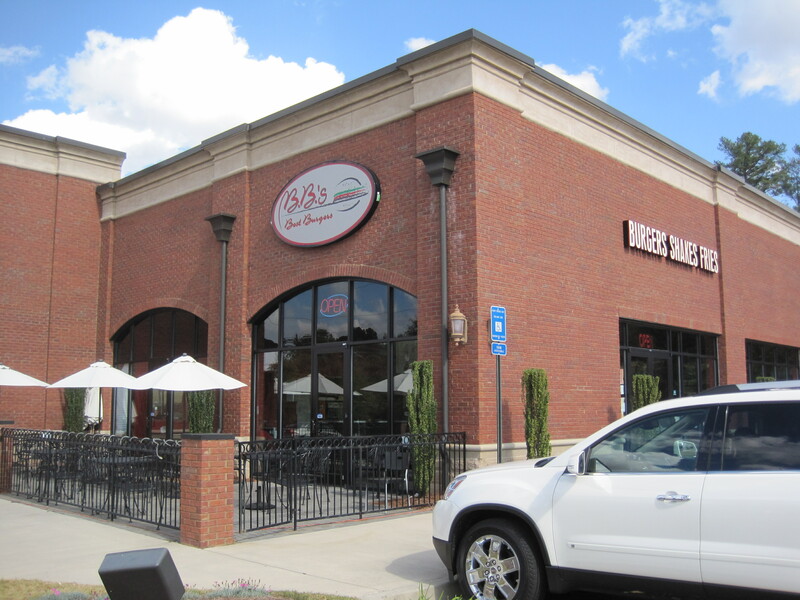 BB’s is a mom and pop place perhaps three blocks north of the intersection of Medlock Bridge and State Bridge Road, a pretty brick eatery on the corner of a strip mall. My wife was wanting to shop at Whole Foods, but had to eat first. We ended up here. Nice design and a clean look give it a very family friendly ambiance. 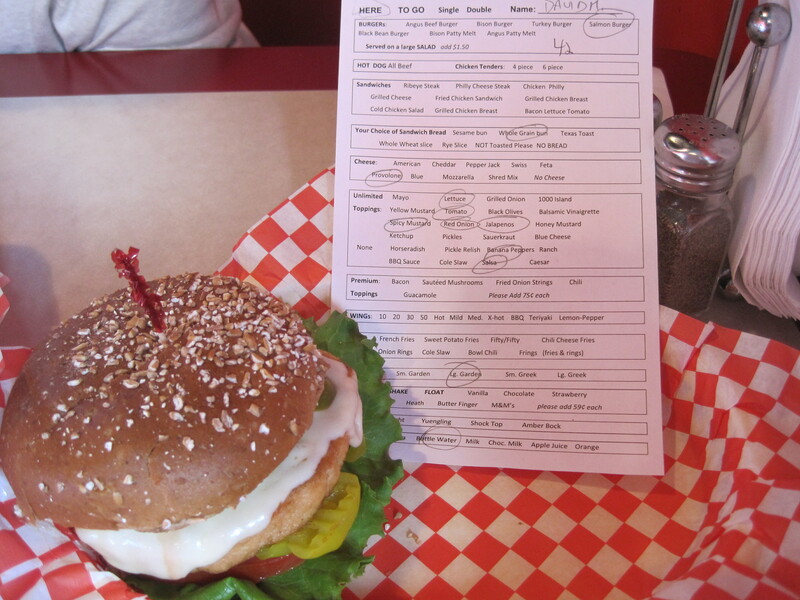 To order, you pick up a clipboard and circle the things you want on your sandwich (or with your sandwich). Beef, chicken, salmon, bison are among the many possibilities. Essentially, it’s a build your own burger setup. It’s all good. A little slow but good. Pricey as well, as feeding the three of us ran about 40 dollars. But hey, with salmon burgers and bison burgers to order, and good sized burgers at that, perhaps its worth paying for the extra time and effort. In one more week I can lift weights again. It’s a relief, because this is the point I get to put my hernia surgery behind me and start trying to work out the way I was when I was losing weight. It’s been a drag, not being able to do lat pulldowns. In the meantime a lot of my eating has been circumscribed, the one big meal a week at a nice restaurant, enough to keep the blog ratings going. Not that Fogo isn’t a bad place to eat, just that the big name places sometimes aren’t as fun as the smaller discoveries, the small owner driven shops that make you realize food involves a creative process, and isn’t just evolved from monster corporations with made up names to satisfy brand registration law. My boonie pepper is looking both worn and fecund. It has more peppers than it ever had. The end of the warm weather seems to bring on a load of fruit and it is more productive now than it has ever been. 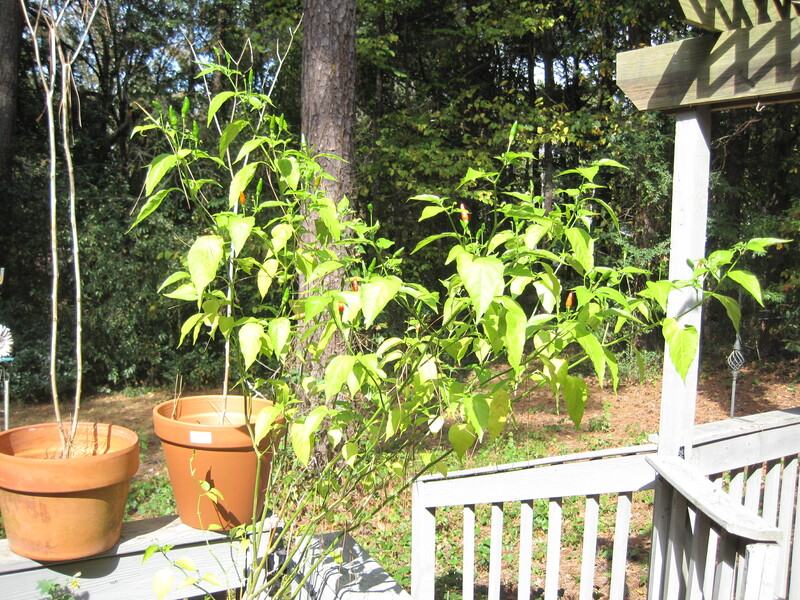 It’s so big it leans, but I’m just impressed how well a tropical pepper behaves in near coat wearing weather. Work is a mess, because my whole division was sold to another corporation, so people are wondering whether they will be downsized integrated into the new corp efficiently. People are quietly leaving, the most marketable of us finding other opportunities rather than face the uncertainties of new bosses and new unfamiliar work habits. That hasn’t helped the blogging process much. So I work a lot on skills these days, trying to be up to date, to be marketable if our new overlords don’t find us to be efficient enough to please them. I’ve been through this before, in a job where we were promised we would be retained. Six months later, half of us were gone. A year later, I was gone too. I can’t rely on the good intentions of my managers when dollars are on the line. I’m a cost, and unless I make more money than I cost, I’m out the door. So in that vein, since my body and my health is part of what I market, I’m looking forward to being able to pump iron. In part, because oxygen is a euphoric, and a healthy exercise regime is the closest I can come to a 19th century oxygen party. 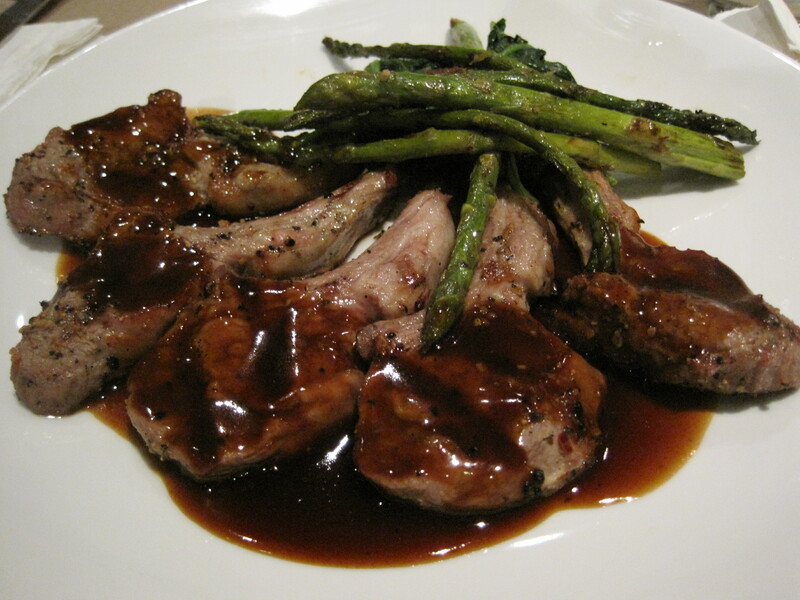 Oh yes, the lamb lollipops from Gary’s Bistro, because they’re fun and they’re good – we need at least one picture, don’t we? 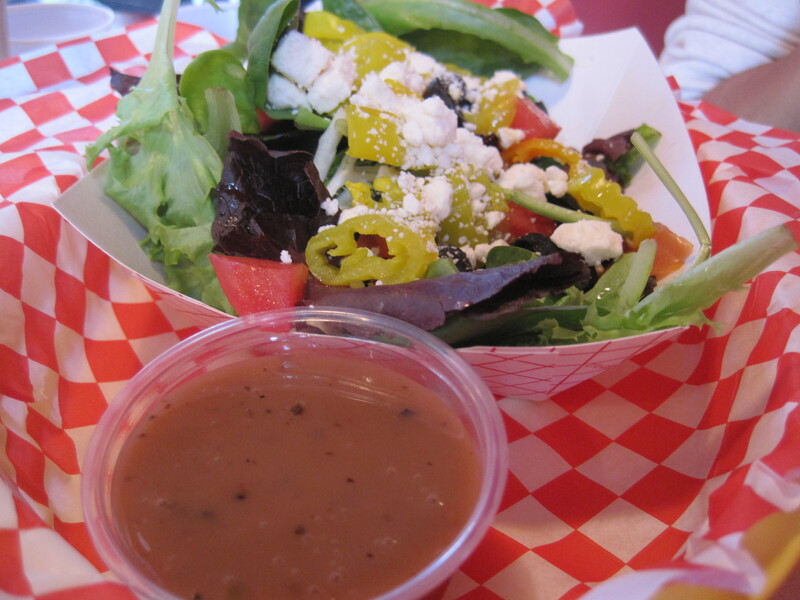 That superb Gary’s service carries over into dinner as well as the lunch hour. It turned out to be a nice place to take my wife, while my daughter was attending her homecoming dance. 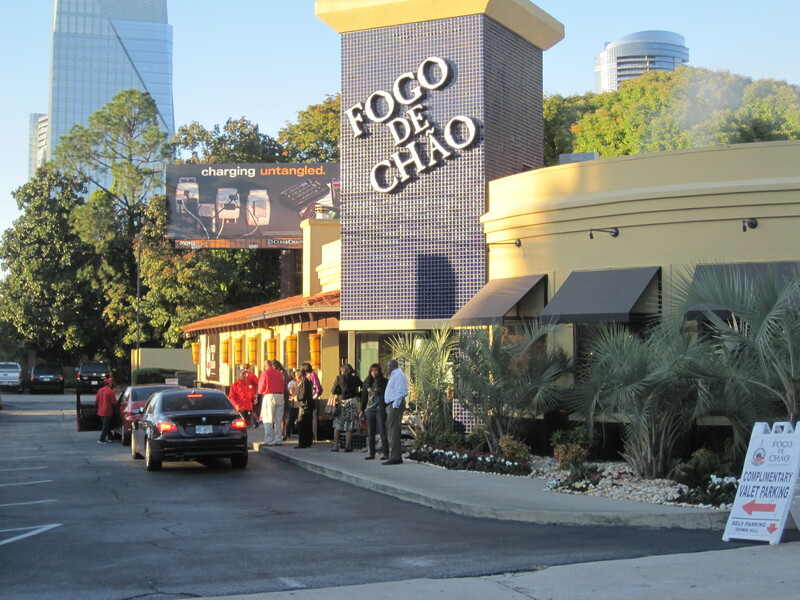 Fogo de Chao is a well run and popular chain of restaurants, perhaps 20 so far, whose presence ranges from our local city to as far east as Beverly Hills, as far west as Philadelphia, with half a dozen locations in Brasil as well. 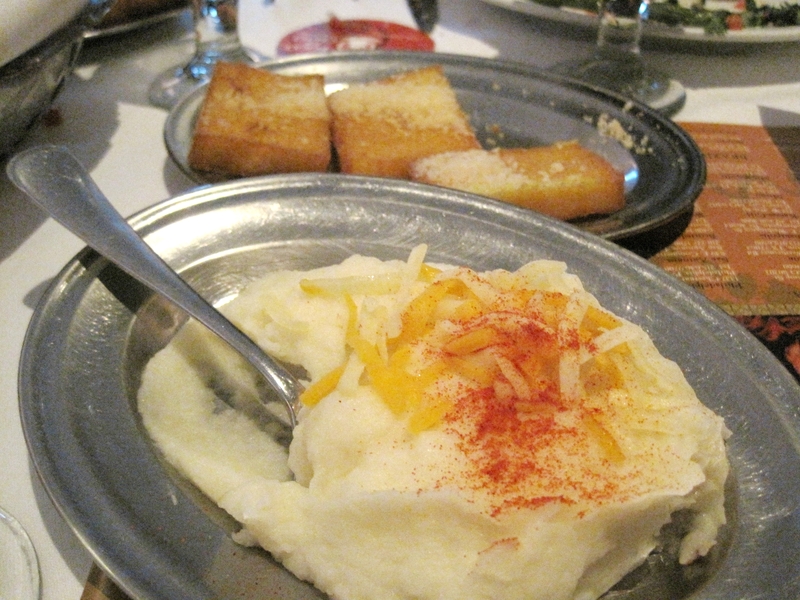 It’s is very popular in Atlanta, and very popular in other urban areas as well, such as Dallas. Trying to tell the blogosphere that this is a good place to eat seems about as pointless as trying to convince people that the sun rises in the east, but on this one day, I had an excuse. Yes, my daughter had a birthday and we were looking for a gift a little more distinctive than a new iPod. So we made reservations. I put on a nice shirt, wore a tie even. And I really don’t like the traffic jam that is the drive into Buckhead, but for one day, and for my daughter, it’s excusable. For those who haven’t been to a churrascaria (Brazilian steakhouse) the drill is this: it’s an all you can eat buffet, but except for the salad bar, the food comes to you (much as in a dim sum restaurant). There is a card on your table with a red and green side. Flip the card to green when you want meat, flip it back to red when you want to digest what you’ve eaten. 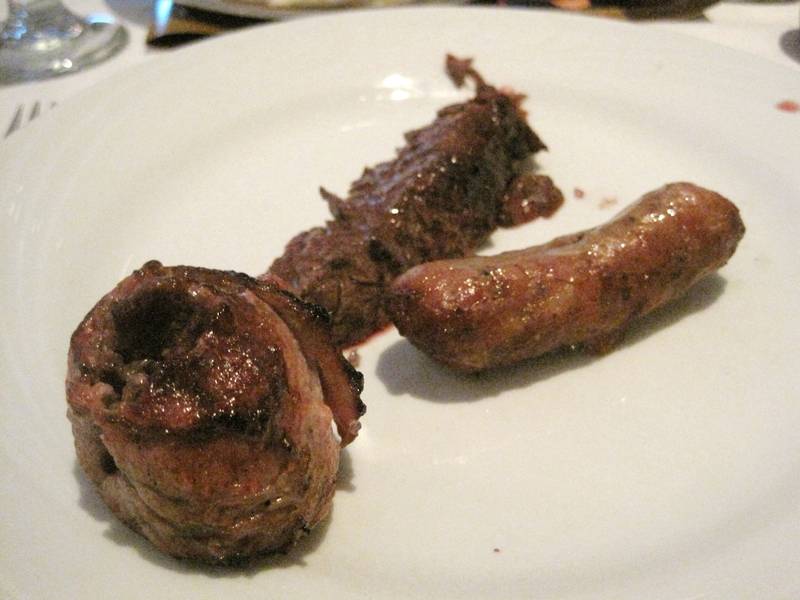 Fogo de Chao is a smaller place than I might have expected. Or at least it gives no real impression of size. 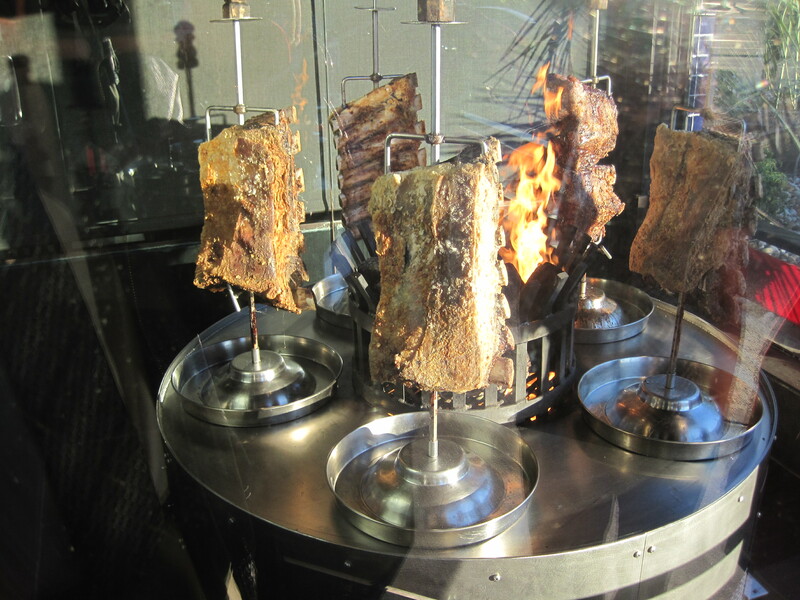 Of course, you get to see meat grilling from the outside as you enter. 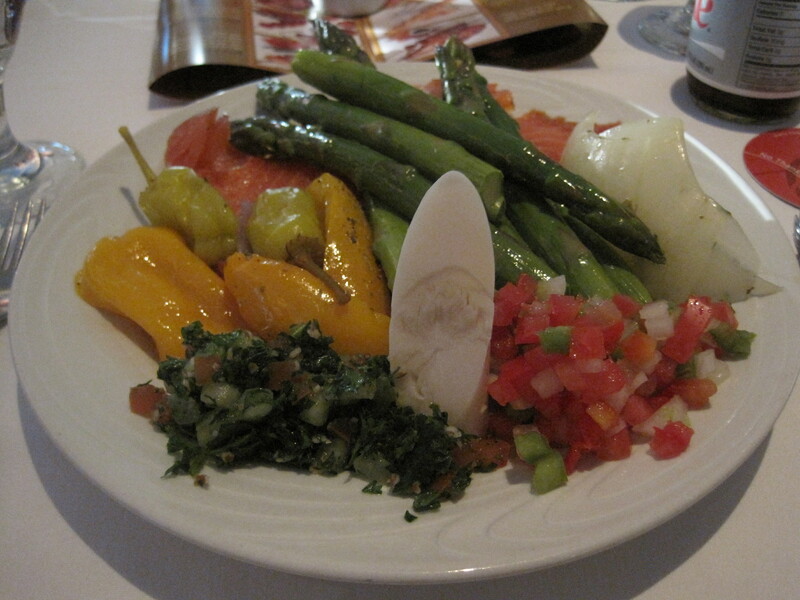 Fogo has an excellent salad bar. Not visible in this photo are a slice of artichoke heart and three excellent cheeses. Smoked salmon is pretty much ground zero for my diet, and guarantees I get my omega 3s in the middle of this meal. Meats, once we were ready for them, came fast and furious. This is unlike Fire of Brasil where the pace is a lot more stately. There were, at times, three gauchos were around our table at once. It became a little confusing sorting out what we wanted to eat. Service was superb. Everyone had more than enough to eat. 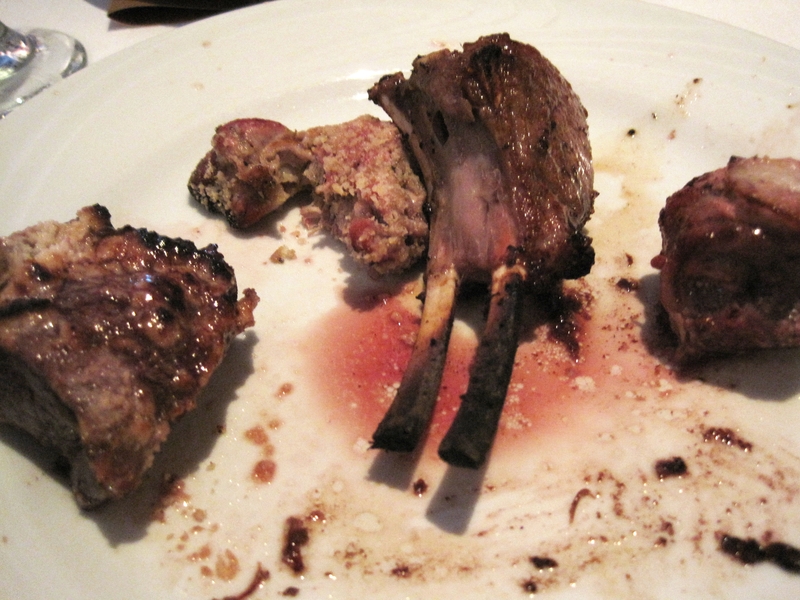 The birthday girl was especially fond of the lamb, though there were some excellent and smoky cuts of sirloin. The pork tenderloin was a little hit or miss. My wife found her piece a little chewy, whereas mine had a wonderful smoky flavor. Verdict: Reigns supreme among ATL churrascarias. 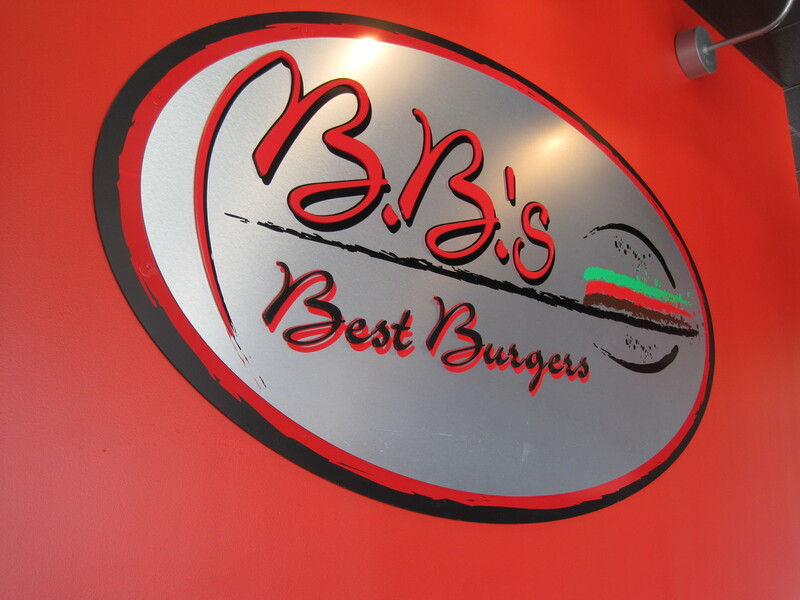 Great food, great meats, over the top service. Very highly recommended. 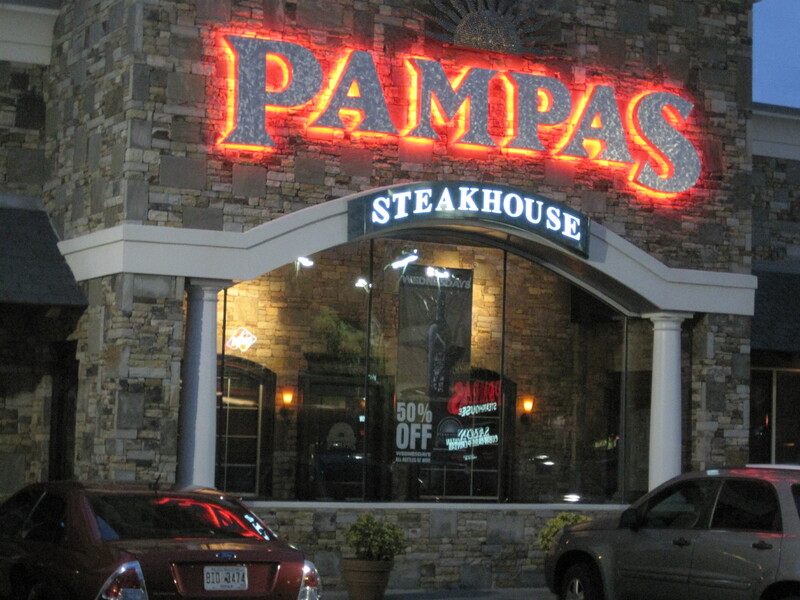 Pampas Steakhouse is an Argentinian style steakhouse, well dressed on the outside and graceful inside. I came there recently, curious, knowing that the serving size of the steaks was huge and trying to get a more normal sized meal out of the eatery. 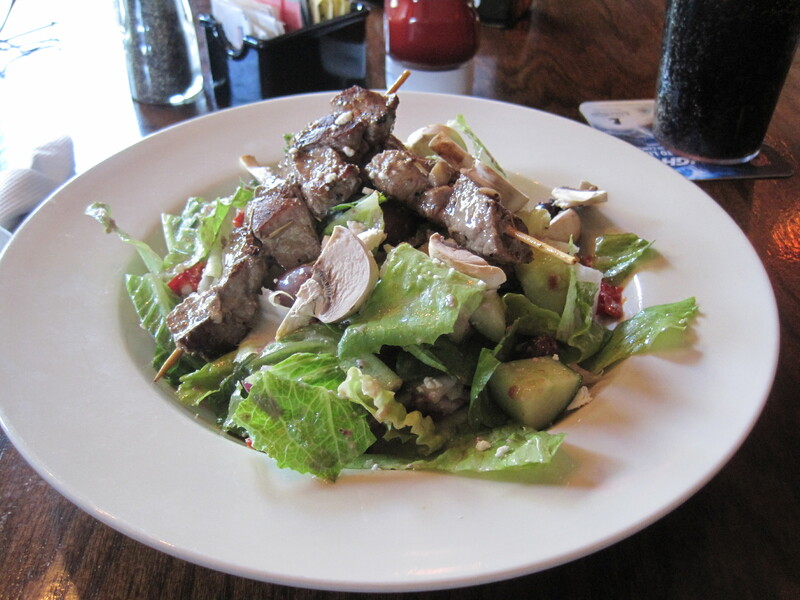 One of the keys to my weight loss has been portion control, and the smallest meat serving at Pampas is about twice the size of my typical serving. More typically, 14 to 20 ounces of meat will end up on your plate. It’s hardly cheap. Meat cuts ran this day from 19 to 56 dollars, averaging in the 30s. 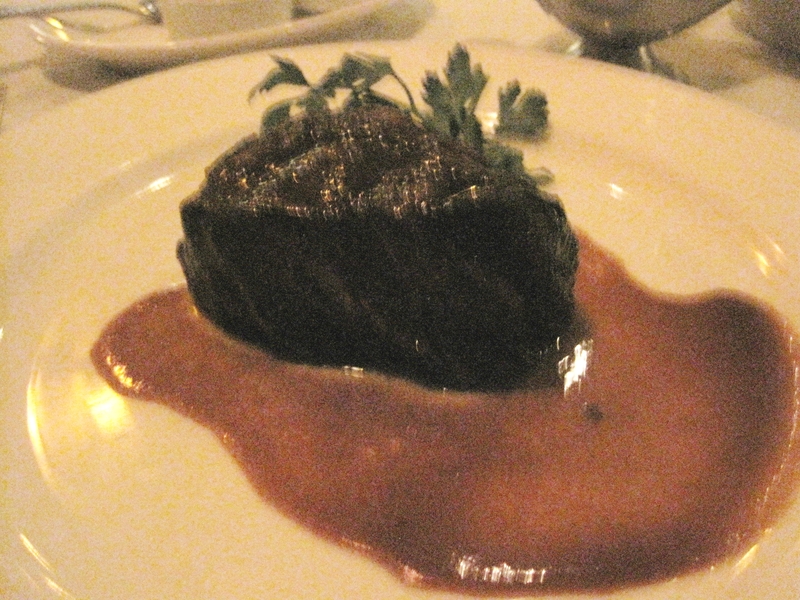 An 8 ounce filet mignon was 25 dollars, one of the more reasonable cuts. I ordered that, some asparagus, and a salad. Later on, I asked if they had any cheeses to finish the meal. That was off the menu but they were able to conjure something up. 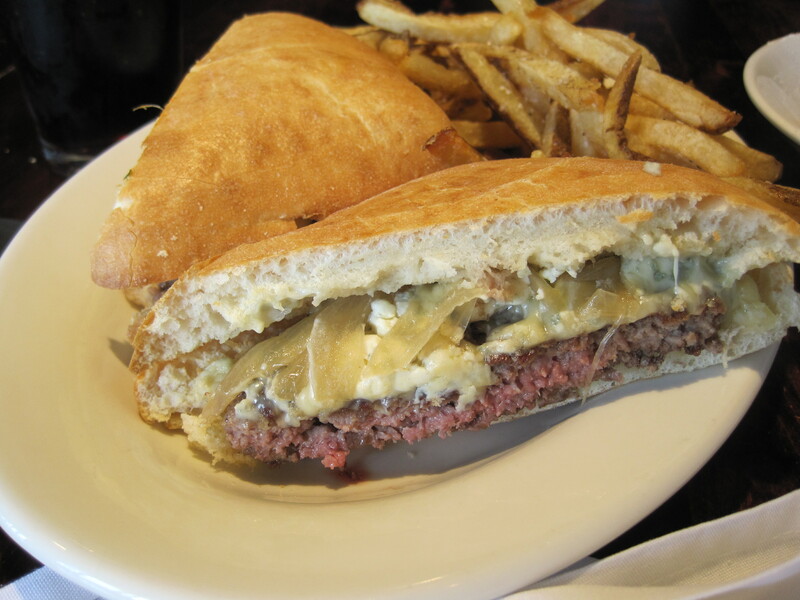 The steak was melt in your mouth tender and perfectly prepared. 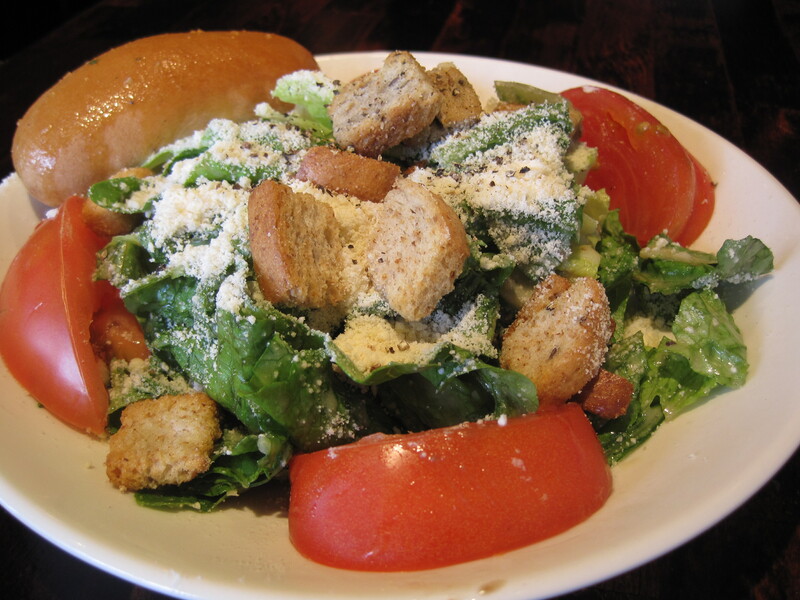 Salads were decent sized. 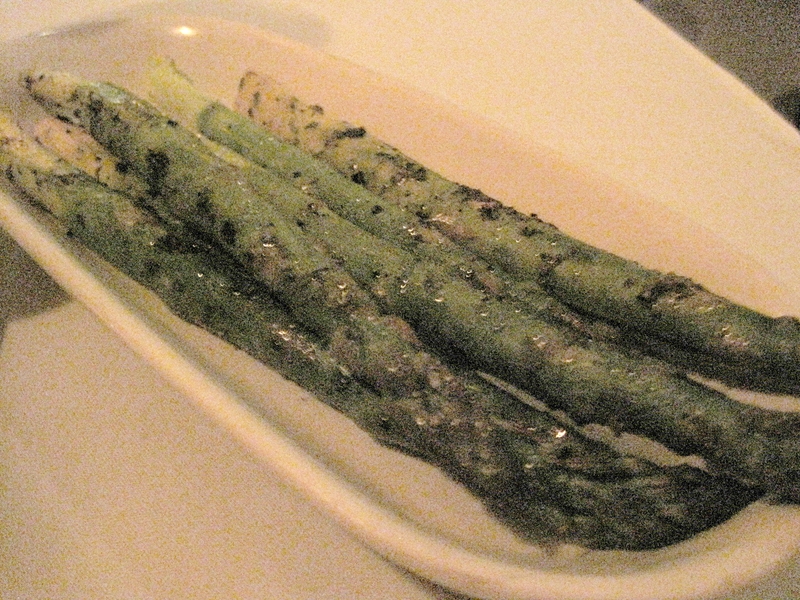 The asparagus I ordered were huge, grilled, wonderful, but there were only 6 stalks, hardly enough for 1 person, much less 2. That was about my only food complaint on a day I felt pampered. Service was lush and omnipresent. My water glass was never empty. Other notes. The main dining area is a large circular region, flanked on half of its sides by curved wine racks, and open through a glass window into a prep area, where you can see staff working on food. The room is thus visually impressive, but it has the same effect as the single room in Arizona’s: you’re caught in a place where conversations are magnified. You share your meal with everyone else in that space. 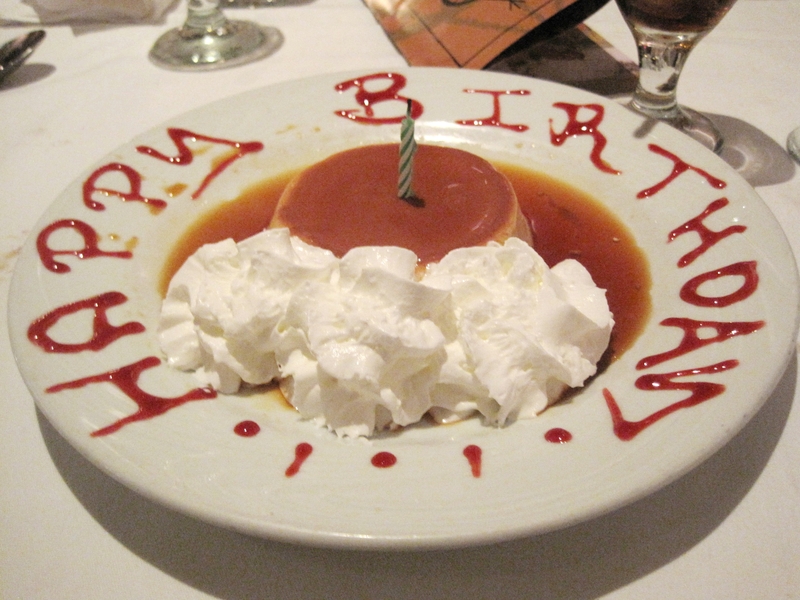 Otherwise, Pampas is a very graceful indulgence, certainly worth the time and effort, if a superb cut of meat handled by expert staff is what you desire. Verdict: Excellent steaks, superb staff. Very highly recommended. Parma Tavern. Drive north on I-85 and exit towards Mall of Georgia. Keep going past the first couple mall entrances. In a nondescript strip mall on the left lies this eatery. Though a decent sized establishment, it is impossible to see from the road. You’ll need to watch signs carefully to find it. Inside, pretty and graceful. A functional bar anchors the eatery on the right as you enter. That’s where I sat. The beer selection is smaller but well thought out. 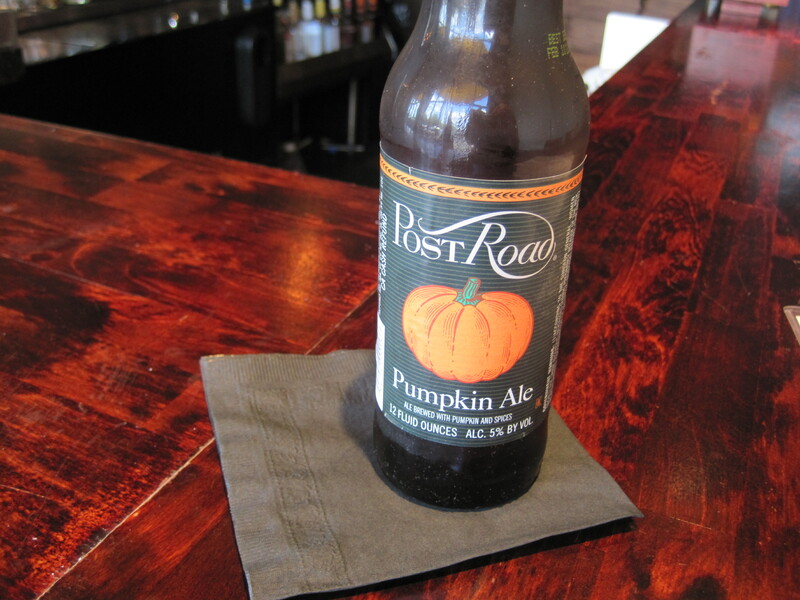 Everything from stock American beers to good draft beers to craft brews can be had. Food? Smaller selection, but with an emphasis on quality. The people who put this place together also did Hearth Pizza Tavern, so it’s a group that knows how to present food. Of the two, I like this place better. More down to earth, not as large, more intimate and homey. Perhaps it was just the bartender, who was talkative that day. No, some of the appeal has to be written off as intangibles, just things that aren’t quantifiable that I liked. Frosted glass windows, does that count?